Kalsarpa Yoga is created by Rahu and Ketu because god of Rahu is Kaal(period) and Ketu is snake. This Yoga is formed when all planets are in between the Rahu and Ketu. This Yoga is more harmful. As the factors of Rahu are quarrel, case, disease, expenditure & problems and factor of Ketu is money. This causes discomfort, disease and loss of wealth. In this case person does useless work. For this reason, this yoga is known as Kalsarpa Yoga not Rahu Yoga. So, please do good work in life and have peace. Snake also represents money, so where will be snake there will be money also. So, good Kalsarpa yoga gives money and pleasure. Bad yoga will cause money loss and body suffers. 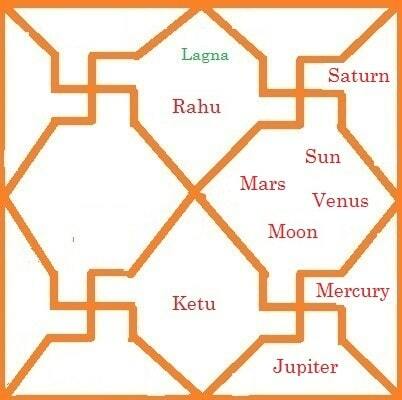 This Yoga is formed when all planets are in between the Rahu and Ketu in horoscope as shown in the image. When Moon is out from Rahu-Ketu and rest planets are in between them then half Kalsarpa Yoga is formed as shown in the below image. Person makes smart and clever from Rahu Yoga but sometimes by showing more cleverness will harm us. In this Yoga we should work with patience. Many people are affected by this Yoga and they face unbearable pain, suffering, family discord and loss of wealth. However, good Yoga people are comparatively happy. 1 : King Parikshit was died from snake sting. But Shree Shukdev told him story of Shrimad Bhagvatam and did his salvation. This Yoga was formed when King Parikshit put a dead snake on the neck of sage sharbhang. His son shrindee sage cursed king Parikshit that who put dead snake in my father neck he will be died by Takshak snake sting in seven days. 2 : Bhishma grandfather's story comes in Mahabharata. When he was sleeping on the arrows bed wounded by Arjuna's arrow. At that time, he was having a lot of trouble. Then he asked Lord Krishna that I have not done any sin in life then why i am facing so much trouble. Then God said, this is your past lives fruit. Then Bhishma saw his past lives and noticed that he was a king behind 72 births. One day he was going for hunting and saw a snake was crossing the road. Then Bhishma thought it would come down into my chariot. So, he removed snake with his arrow, but accidentally snake went on thorns. The thorns were pricked into snake body. Due to this, Bhishma had to face trouble onto arrows bed. This snake effect is known as Kalsarpa Yoga. 3 : One Aghasur monster came into snake yoni and sudershan also came into this yoni by cursed of sage. They were released by Lord Krishna. 4 : Many times we have seen that snake sting only that person among many who has this Yoga. This is because of this Kalsarpa Yoga. 5 : One story comes in Bhagwat that a Nahush king became king of heaven by doing hundred Ashwamedha. But a bad idea came to his mind of making Indra's wife his own wife. Then shachee Indra's wife went to jupiter for solution of this problem. Jupiter advised her to request Nahush if he wants him then he came in chariot having saint instead of horses. Then Nahush king hold the chariot into the saints and repeatedly saying snake-snake to them. Then saint cursed Nahush king to fall into snake yoni. That's why we should respect saints. 6 : It is written in Mansagari that "Lagnaachcha saptame sthane shani rahu sanyuto || sarpen baadhaa tasyoktaa shyyaanyaa svapatoapich ||"
The effect of Rahu-Ketu remains lifetime. Their effect is especially seen in their own time. When this yoga is formed then please do not do quarrel with anyone, no debate otherwise we have to go to Jail. Please work with patience. Rahu's mother name was Sinhika the daughter of Daanvraj Hiranyakashipu. His father was Vipu the king of demons. A story comes in Shrimad Bhagvat that during Samudra Manthan God watered the Amrit that came out to Devetas, but Rahu understood that he will not get Amrit, so he sat in between Sun and Moon in Devetas. Moon was just behind the Rahu, so Amrit had to drink to Rahu. After that Shri Bhagwan cut his head from his sudrashan chakra. From that time, there are two forms of planet Rahu, upper part of the body becomes Rahu and lower part becomes Ketu. As Rahu-Ketu took Amrit so they become immortal. For this reason, they are also worshiped in nine planets. Rahu and Ketu are not free planet but they are shadow planet.